Today we visited Prague castle. Apparently the largest castle complex in the world. Very impressive but not very castle-like. Big cathedral and palace. Saw changing of guard twice. Wendy and i shot crossbows. I was the best! Wendy was merely okay. Tonight we ate at the U Prince Hotel. On 6th floor terrace had they of old square and castle. Was amazing and food was great too. Thanks Louise and JJ for recommendation. 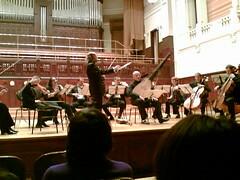 Then we got all cultured and went to see the Vivaldi Orchestra Praga at the Municipal House. They played some Händel and Vivaldi's Four Seasons. Very impressive. Then we went to a bar and loads of beer for about GBP2.